A lot of people are not sure how man-made diamonds and cubic zirconia differ, and some even think that they are the same thing. Although they look similar, these two types of stones are actually quite different. Let’s see what they are made of and how you can tell the difference between cubic zirconia and man-made diamonds (also known as synthetic diamonds). What Is Cubic Zirconia Made Of? Cubic zirconia is a form of zirconium dioxide. It is created synthetically and is usually colorless and relatively flawless. Since its optical and physical properties resemble to some extent those of diamond, cubic zirconia is often used as a diamond imitation. How Are Man-Made Diamonds Created? Man-made diamonds are created synthetically in a lab. They are also known as lab-grown diamonds, cultivated diamonds, synthetic diamonds, created diamonds, and cultured diamonds. Contrary to what some people think, man-made diamonds are not considered fake just because they are made artificially. These stones are real diamonds as they have the same chemical composition and physical characteristics as natural diamonds. More: Click here to see a selection of the latest and most popular diamond jewelry designs. Cubic zirconia and man-made diamonds differ in their physical and chemical properties. Man-made diamonds are significantly more durable than cubic zirconia. This is mainly due to the differences in hardness between these stones: While synthetic diamonds are rated 10 on the Mohs scale of hardness, cubic zirconia has a rating of 8.5. For this reason, cubic zirconia is much easier to scratch and is generally less durable than lab-created diamonds. More: Check out this extensive selection of cubic zirconia jewelry. Since cubic zirconia is softer than man-made diamonds, when cut and polished, these two materials differ in how sharp the edges of their facets are. Synthetics, like natural diamonds, have facets with very sharp edges. Faceted cubic zirconia stones, on the other hand, have edges that are more rounded, and with time, they become even rounder as the material wears out. Tip: If you are looking to buy real diamond jewelry, we recommend that you buy from a place where you can see the actual stone before the purchase. James Allen is one such retailer that allows you to see each loose diamond from all sides with its 360-degree diamond display technology. Cubic zirconia has higher dispersion, and for this reason, when exposed to light, this stone exhibits flashes that are more colorful than those in a synthetic diamonds. Cubic zirconia is a material that is heavier than natural and synthetic diamond. Therefore, if you weigh a cubic zirconia stone and compare its weight with that of a man-made diamond of similar size, the cubic zirconia should be significantly heavier. Man-made diamonds have the same properties as natural diamonds, and although synthetics are cheaper to produce, they are still relatively expensive compared with cubic zirconia. Actually, it is very often the case that a cubic zirconia costs a fraction of the price of a created diamond of similar size, color, and clarity. Although cubic zirconia usually is clearer and more colorless than most natural diamonds due to its synthetic origin, man-made diamonds are more likely to have color and clarity that are just as good. While lab-created diamonds can have yellowish tints and sometimes even have natural-looking flaws, the artificial process used to produce these stones usually ensures that defects are minimized, as is the case with cubic zirconia. For that reason, how clear and colorless a stone looks should not be your primary way of telling man-made diamonds from cubic zirconia. Man-made diamonds and cubic zirconia differ in the way they conduct heat and electricity. This makes it easy to tell them apart with a diamond tester, which is basically a device that measures the conductive properties of materials. This is also why using such a tool is the most certain way to tell whether the stone you have is a diamond or something else. Selling Your Old Jewelry: How Much Money Can You Get? What Are the Places Where You Can Sell Your Diamonds? 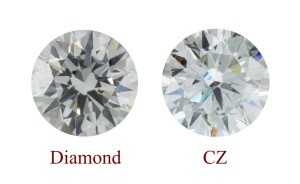 Differences Between Lab-Created Diamonds & Simulants?